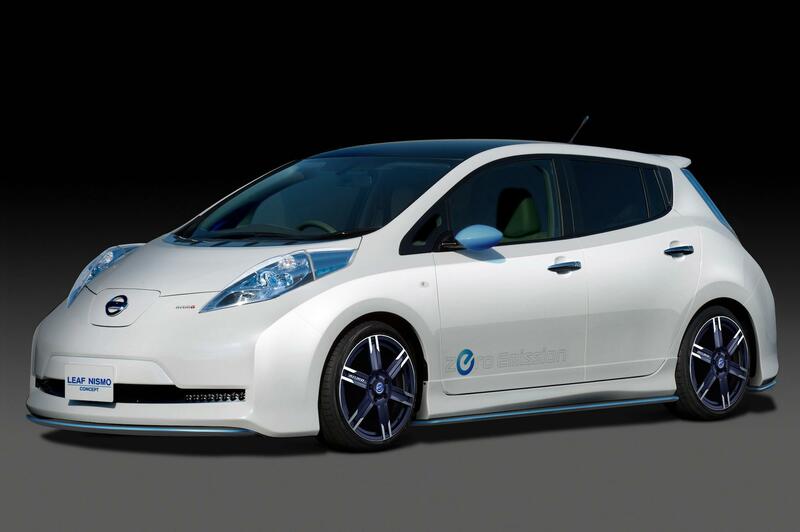 The Nissan LEAF is a bit cooler in Japan, we’re sad to say. In its native land, the slightly dorky EV can be all tricked out with a body kit, flashy interior bits, and a performance ECU upgrade from Nissan tuning arm NISMO. That’s right, for 136,500 Yen ($1,400), LEAF owners can have their car’s performance improved. The upgrade unleashes a bit more power – how much, we don’t yet know – without ruining the battery range. Not only does the acceleration improve, NISMO also reworks the Eco mode, which boosts cruising range, according to Green Car Reports. Not only can Japanese buyers make their LEAF a bit quicker, they can also make it stand out in a crowd, too. As we’ve reported before, NISMO offers a body kit for the LEAF in either fiber-reinforced plastic or wet carbon. What does it cost, though? A staggering $10,225. For the Japanese EV fanboy with more money to blow, NISMO also offers a $1080 sport suspension, some $450 18-inch alloy wheels, and a selection of white floor mats, blue-tinted mirrors, and blue carbon fiber trim pieces. As much as we like EVs and carbon fiber separately, combining the two – to us – is like a bald guy getting a $400 haircut. Upon closer inspection, it might look a bit better than regular but it totally wasn’t worth the upgrade as the average observer won’t notice the difference. It’s amusing to us, though, as Nissan slashes prices on the U.S.-built LEAF to attract more buyers here in the States, Nissan is scrounging around looking for ways to make the LEAF more expensive in Japan.